The Xperia J is trying to stick to a budget, so you shouldn't expect any special treats in the retail package. All the basics are covered though. The phone comes with the usual A/C adapter, a USB cable that's used for both charging and data connections, and a single-piece headset. This is the place to get the best view of the Xperia J and enjoy the subtle inward curve that is the defining design element of no other but Sony's current flagship, the Xperia T. The Xperia J is clearly smaller than the Bond phone, which is hardly a surprise considering the difference in screen size. In terms of size, the Sony Ericsson Xperia arc is a much better reference. The two phones have a nearly identical footprint and weigh the same. 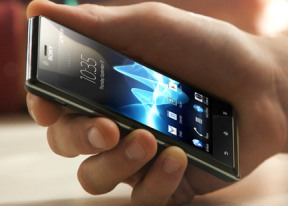 However, the Xperia J fails to match the Arc's super slim waistline. It bets instead on practicality, with a plain but comfortable fingerprint-proof finish. The plain-looking, angular front is in tune with Sony's current design language and you may struggle to tell the Xperia J apart from some of its siblings by simply comparing photos. One telling difference - which will be felt in daily use too - is the location of the capacitive controls. They're almost at the very bottom of the phone's front and thus a little less comfortable to reach without compromising the secure grip on the handset. The bad thing is the low position of the capacitive keys hasn't minimized the bezel. As most Sony smartphones, the Xperia J doesn't make the best use of the available space. The device looks taller than the screen size requires, and isn't impressively thin either. We didn't expect anything super slim for the asking price anyway, and we're perfectly happy with the looks and feel of the Xperia J. The fingerprint prone front is par for the course with smartphones these days anyway. The curved body is certainly one of Xperia J key features, in that it makes a neat, all-plastic phone get a bit of personality. Above the display we find the earpiece, the front VGA camera and a tiny status LED next to it. Below the screen are the capacitive Back, Home and Menu keys, which light up briefly as you unlock the screen but the backlighting is otherwise off until you tap on one of them. There's no setting to change that behavior and the lack of an ambient light sensor means they wonâ€™t illuminate automatically. The keys are haptic enabled, producing short sharp vibrations upon a tap. The mic pinhole is just below the Menu key. On the right side of the Xperia J we find the Lock/Power key, the slim volume rocker and a slit to lift up and release the battery cover. The power/lock button is tiny and has very poor press feedback. The thin volume rocker on the other hand is comfortably curved for touch orientation and reasonably solid to press. The left side features the microUSB port only, serving both for charging and computer connections. The top of the Xperia J has only the 3.5mm audio jack. The bottom is completely bare, save for a hidden LED right where the chrome frame meets the slanting bottom edge of the front. It glows for a few seconds each time you unlock your Xperia J, matching the currently selected color theme and will also activate on some social events â€“ the tiny status LED next to the earpiece is in charge of all the other notifications. The back of the Xperia J looks neat and practical, and we think the soft rubbery finish is way better than the glossy back of the Xperia arc, not only in terms of looks but hand feel too. The 5MP camera lens and the LED flash are in the top left corner, with the Xperia logo centrally placed in the top half and the loudspeaker grille at the very bottom. There is a lanyard eyelet in the bottom right corner too. Underneath the battery cover you'll spot the 1750 mAh battery, the microSD slot and the SIM compartment. The memory card slot might look hot-swappable, but the battery stands in the way and won't let you insert or eject a card. 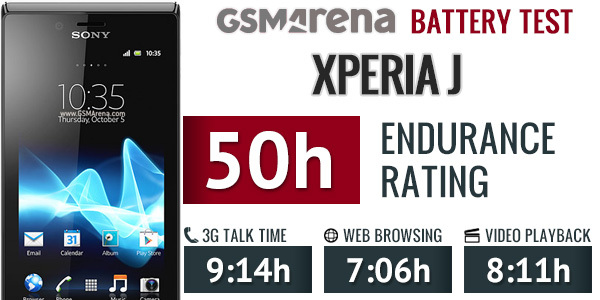 The Sony Xperia J fared impressively well in our dedicated battery test, scoring an endurance rating of 50h. This means that you'll only need to charge the smartphone every other day if you use it for an hour of talk-time, an hour of web browsing and an hour of video-watching per day.